At the 2012 Tribeca Film Festival all of the talk was not about any of the features rather it was about a short horror film called FOXES. Anyone who had run across it would there after ask if anyone had seen it. I had several people insist that I see it. It took a bit but once I did everything changed. I was now one of those guys who was asking everyone if they saw the film. It was a game changer for how we saw horror. I can't tell you what it was about the film that rattled us but it messed everyone up who saw it and it made all who saw it jones for the next film from it's director Lorcan Finnegan. ...and he graciously emailed me back and said that if I could wait a little bit he'd get me a screener. Plans to cover the film for the Brooklyn Horror Festival (where it won the Best Feature and Best Director awards) fell through. Eventually a screening was arranged and I sat down in a darkened room and I saw WITHOUT NAME. When it was done I was blown away. As I said in my review (read it here) the film is a masterpiece of slow burn horror and as good as horror films get. After collecting my jaw from the floor I emailed Lorcan to ask if would he be willing to give me a brief interview. He said yes, and a couple of days later after another brief email exchange we had an interview. There are no spoilers. As much as I wanted to ask detailed questions- I would love answers to some of the films mysteries- I stayed away from asking anything that would spoil the film for those who haven't seen it. This is one you all have to discover on your own. Before I turn you over to the interview I need to thank Lorcan Finnegan for not only arranging a screening for me, but also taking the time to answer my questions. This was an absolute joy to do. STEVE: How do you classify the film? Is it a psychological horror film? Would you call it an environmental horror film? Landscape horror? A ghost story, since very clearly Eric is haunted? Or would you just say that it's a horror film? LORCAN : It's a tricky one to classify because classification brings so many pre-conceptions and expectations and as you know, it's a film about things beyond our understanding. It's sort of between genres, but I'd say it's both psychological and supernatural. I'm hoping audiences will classify it for me! 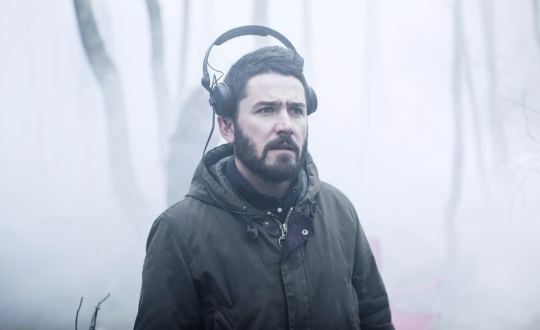 STEVE: You've made a film that is very much about the landscape- both internal and external. Its a film that is in its way about being outside even when one is inside. What is it that draws you to the land? I ask this because even your earlier film FOXES is tied to the land its set on. LORCAN: I have always been interested in nature and natural surroundings and both Garret and I seem to have a preoccupation with man's place in the natural world. I grew up on a peninsula with forests and fields and surrounded by an ever changing sea. When I was a kid I'd go hunting and fishing and collecting wild mushrooms and generally immersing myself in the wild. Traditional faery stories also tend to be about the land and how we shouldn't mess with it. The Faery are really just a personification of the ineffable forces of nature. So I'm probably predisposed to nature or 'the land' as a muse. STEVE: Both WITHOUT NAME and FOXES are constructed without any real jump scares. The tension in both is deeper and more visceral than in most conventional films as a result there isn't a release. Actually both films end in such away that we end up carrying the dread into the daylight. Do you think not releasing the dread by not resorting to jump scares results in a more realistic film since life doesn't have people jumping out and going "boo"? How do you feel about the reliance of modern horror films on jump scare over the creation of mood? LORCAN: Jump scares often work like little pressure valves, so the tension in a scene builds and then there is a release with a jump, before it starts to build again. For WITHOUT NAME and FOXES I didn't feel the need to break the spell, I found it more interesting to gradually amp up the atmosphere and never fully release the pressure until the end. By creating an intense atmosphere without release, the audience don't have time to become self aware, which can happen when jump scares are used. Some great films have moments that make me jump, so I'm not against the idea, but it can also become a cheap trick that is used in a self conscious way. A 'boo!' jump scare is really just a reflex to the unexpected, it can be fun but for me it's not the same as genuinely unsettling anxiety or dread. Atmosphere and the use of visual language to engage with an audience on a psychological or even subconscious level is more intriguing to me. STEVE: Another way that WITHOUT NAME breaks with most modern horror films is that there is no "gotcha" ending. The film builds to its conclusion and then ends where it should. How do you feel about films that add in a final gotcha on the end even when it isn't called for? LORCAN: Like when a creature or ghost suddenly pounce towards the camera at the end? Maybe if the film is aimed for a younger audience they might enjoy something like that, but to me it can cheapen a film and has become cliché. If it's called for then cool, but I'm not a fan of adding things just for easily gained reactions. STEVE:The film is full of silences. The sound is that or life or the location. What is it about silences that draws you to it? Do you find it hard not do go like most people and fill every quiet moment with sound or music? LORCAN: We used a lot of various winds and natural sounds, so although it may seem quiet at times, it's never altogether silent. I work quite instinctively, so the choices to add music, sound design or quieter breezes were based on how Tony (the editor) and I felt the scene should be. Tony was cutting the film as we were shooting so I could see the scenes taking shape and get a sense of the vibe. The composers, Gav and Neil, had made lots of sound sketches based on the script, so when we were shooting I already had the score in my head and we could put the pictures to their music. So I was thinking about the hypnotic nature of quieter moments while shooting and then feeding that back into performance and images. STEVE: In your films the horrors that we see are largely unexplained. We see what is happening, we are frightened by it, but ultimately there are no answers on the screen. When constructing the films do you have answers that the audience doesn't have or are you just as unaware as the audience as to what is happening? LORCAN: I have all the answers! I have to have my version of what's happening so I can shoot what I need for the edit but then I like to give the audience just enough to piece it back together and draw their own conclusion. With a story like WITHOUT NAME you have to be a little abstract and use the elemental in an impressionistic way to create a feeling. I was trying to make a film that made sense in the way a dream makes sense to the dreamer. There had to be a satisfying conclusion but enough ambiguity for the audience to have their version of what exactly happened to Eric. Because cinema is primarily a visual medium I was able to say much of what was in the script without dialogue, using images with sound design or music to convey information. On the other hand, the script had to be read by people. So the script had more dialogue and even a voiceover to let us know what Eric was reading in Devoy's book. These were necessary for the reader but we knew we'd probably ditch a lot of it in the edit and convey all of this information visually instead. Garret and I work on the basis that a script is for reading and a film is for watching, a lot can change in the process. STEVE: How do you work with Garrett Shanley who wrote the screenplay? Who came up with the idea for the film? And since so much of the film is in the silences and the internal acting of the performers do you find it more difficult to direct the script? LORCAN: Garret and I talk a lot about ideas, themes and concepts then eventually we'll settle on something. With this film we decided that it would be a story about (spoiler alert!) a place that protected itself from human interference by developing an entity that could trap your soul to make it a guardian. If taken, the only way out is to trap a new guardian to replace you. That was basically it. I think that idea came about by filtering down lots of our preoccupations. Once we decided on that concept, Garret wrote a draft, which was full of great (and some crazy) ideas. Garret, Brunella (the producer and my wife!) and I knew where we wanted to take it, so he wrote a new draft. There were a couple more drafts before shooting but nothing major changes from the second draft. In terms of directing a quiet script, I don't find that any more difficult, it was very enjoyable. One of the themes in the film is communication, or lack of it. So allowing the actors to communicate without saying much felt right. STEVE: Since so much of the film is action- did the screen play have places where the actors could improvise or did you have a tight control over what you wanted? LORCAN: There wasn't much improvising really. We shot the script and sometimes reduced the dialogue or changed the delivery. We just played with the scenes and altered dialogue to make everything feel natural. STEVE:With so much of the film is told in the expressions and body language of the actors, especially Alan McKenna,it's obvious that had the cast been even the slightest bit wrong the whole thing would have collapsed. (it was perfect which is why it works) I have to ask how did you cast the film? Was the script written for people you knew or did you have to audition people? LORCAN: We cast in a pretty traditional way. We got a casting director involved and had casting sessions. Eric was always going to be a tough one to crack but we got lucky with Alan. The casting director was represented by United Talent, an agency in London who also represent lots of actors. She asked them if they could put forward some suggestions and Alan was one of them. I saw he was in (and wrote) a short film that wasn't available online yet. So I contacted the director via Vimeo and asked if I could see the film. He sent me the password and as I was watching the film I got a mail from Alan saying that he had recently watched my short film FOXES and loved it and hoped I enjoyed their short. I thought he was great so I asked him would he do a self tape audition for Eric and he agreed. He did some pretty difficult scenes, including having a full on breakdown and was brilliant. So we met in London for a chat, got on very well and I offered him the part. We saw a lot of people for Gus and Olivia. During one of the sessions James was meditating outside the audition room, then came in and explained that he had just come back from spending 6 months in India on his own. He was Gus already, so he nailed it and got the part. Niamh had actually mailed me a couple of years before saying that she had seen FOXES and wanted to work with me if something came up. She came in and auditioned. I thought she was a contender. Then, unprompted, she made a new self tape at home and mailed it to me, saying that she didn't think her first audition went well and wanted to go again. Her enthusiasm, and of course her talent, won me over so I cast her. I was looking for the right balance of looks and textures from the cast and I think we found a nice balance for the film. STEVE: The images in the film are pretty much perfect. I can't remember when I saw a film, especially one shot on location where all of the images are perfect in construction so that they not only look good but create a mood beyond that. Did you plan each shot or did you luck into them? LORCAN: A location brings so much to a film, it's going to take up a large percentage of the picture so it has to be carefully chosen. I spend a long time finding the right locations and then storyboarded everything. There was of course lots of luck involved also, as is always the case. And the very talented Piers McGrail behind the camera. The main woods that I wanted for 'Gan Ainm' was a national park area and had turned down many films in the past. So we were definitely lucky there, I didn't have a plan B.
STEVE: How did you do the light shifts in the woods? was it practical or did you do it with computers? 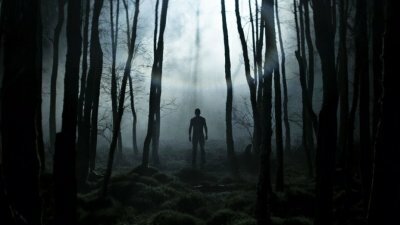 LORCAN: I wanted the lights moving through the trees to have a sentient feeling but still feel like natural. Piers and I initially thought that maybe we could put a big light source on tracks and move them through the trees, then paint out the light source and tracks, leaving behind only the effect of the light on the trees. It didn't work at all. So while shooting we asked our gaffer to keep an eye out for passing clouds. When it looked like something interesting was going to happen we'd point the camera into the trees and let it roll. The natural lighting in the location was very dramatic so we used it to our advantage. STEVE: I have been asked by someone who saw the film at the Brooklyn Horror Festival to ask you about the book. How long did it take to create it? LORCAN: We gave the book to Fergal Brennan, an artist and filmmaker friend of ours, to make. Garret wrote all sorts of ramblings and I included a list of things we'd need to see. I think it took him a couple of weeks to complete all the drawings and handwritten notes. STEVE: When you emailed me before I saw the film you indicated that the film is a slow burn. Did you worry that you might lose people if you stretched things out too long? How did you work out how far you could go without the audience giving up on the film? 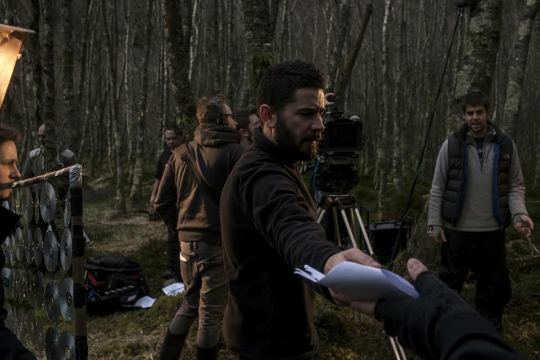 LORCAN: The film is all about tone and atmosphere so you really need to let yourself be hypnotised and drawn into the story, much like Eric is enchanted by the woods. Inevitably some people are not going to like that or be immune to it's effects whereas others will thoroughly enjoy the effects and have a great experience. When we were cutting it we just had to find a pace that we enjoyed and was working for the film. We could have ramped up the pace but I don't think the final act would have the same impact. As you know, it gets pretty crazy towards the end. Audiences seem to be enjoying the tension of the pace though, so we're happy. STEVE: The film ideally should be seen as big as possible, in as dark a room as possible, with the best sound possible and no distractions. Do you worry that people who don't see it that way are not going to connect to it in the way that they should because they won't see it under optimal conditions? How do you feel about people watching films on phones or laps tops? 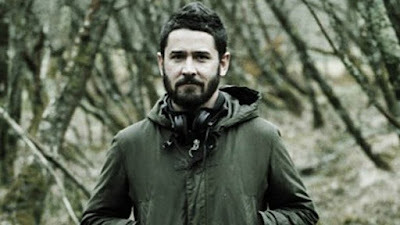 LORCAN: I designed the film as a 'cinematic experience' and it is definitely the best place to see it but I watch a lot of films at home on a big TV and still connect with them. With fewer and fewer good films getting general theatrical release more people are watching the films that they seek out on a TV screen, luckily TVs are pretty great now. WITHOUT NAME will still be enjoyable as VOD but the soundscape really adds to the intensity of the film so I just encourage people to view it on as large a screen as possible and with good sound. As for watching it on a laptop or phone, that's just not cool at all at all. STEVE: Did you have any trouble with money people insisting on you add in some blood and guts to make it more marketable? Did you have any interference or did you get to make the film you wanted to make? LORCAN: We were very lucky on that front. The film was fully financed by the Irish Film Board under a scheme called the Catalyst Project. It was a competitive process whereby three films were funded, WITHOUT NAME was one of the winning films. The financiers were very supportive, they also financed FOXES so they knew the type of film I was planning on making and we were all on the same page from the beginning. We didn't have a big budget to make it, but we did have a lot of creative freedom. STEVE: I know it's a standard issue question but I find the answers chosen can be intriguing - so forgive me for asking what sort of films, horror and otherwise do you like? LORCAN: I like all sorts of movies but I'm more drawn towards the strange. I love older films like 2001 SPACE ODYSSEY, WALKABOUT, THE TENANT, PICNIC AT HANGING ROCK, PERSONA, THE WOMAN IN THE DUNES, THE INNOCENTS, DON'T LOOK NOW, LEMMING, THE FLY and hundreds more. I also love some more recent films like UNDER THE SKIN, THE WITCH, DOG TOOTH, ANTICHRIST, ENEMY and UPSTREAM COLOUR to name a few. I tend to watch more older films while waiting for new films to be made or become available to watch. As you know, there are tons of great movies being made that just don't get decent distribution because the cast aren't famous or they aren't in English etc, which is something I'd like to see change. Mostly because I want to see more good films and am happy to pay for them! STEVE: will you be returning to the forest for your next project or do you have something else in mind? LORCAN: The complete opposite actually, we'll be going to a world devoid of all earthly nature in a sci-fi suburban nightmare. We're also working on a film that will heavily feature the sea and another set on a lake, so there's more nature to come.